A couple of weeks ago, Dana’s Creative Services shared information about why having an editorial style guide is important. It’s not just large universities that have editorial style guides—colleges of all sizes have style guides to ensure their communications and marketing pieces have a consistent style and voice to support their brand. Today, I’ve found five examples of college and university style guides that you can use as an example when creating your own style guide. If your university doesn’t have editorial style guidelines (or if you’re hoping to update your university’s guidelines), you can use these as inspiration. 1. Iowa State University. This university’s editorial style guide is part of its overall visual identity system that supports its brand. The guide addresses items like acceptable abbreviations to use, how to capitalize academic and administrative titles, formal names for departments, words to avoid using, and capitalization rules. 2. Saint Leo University. Because of this university’s multiple centers across the country, it’s important its staff at all locations adhere to a consistent style to support the university brand. This comprehensive style guide addresses standard descriptions of commonly used terms; key university messages; punctuation; official terminology for university buildings, landmarks, and center locations; and commonly used acronyms. 3. University of Missouri. This university established its writing and editing guidelines to help “ensure clarity and cohesion while reinforcing Mizzou’s distinctive identity.” The editorial style guide include an A-Z list of common terms and word usage (such as adviser, not advisor), info on how to write good captions and headlines, and tips for finding facts about the university, interviewing sources, and fact checking articles. 4. Beloit College. This Wisconsin college’s style guide covers commonly used terms, names and descriptions of campus facilities, how to list alumni graduation dates, and more. 5. Swarthmore College. 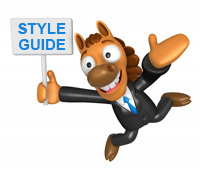 This Pennsylvania college’s style guide includes guidelines on everything from academic degrees and student organization names to punctuation usage and class note style.